The drainage and substrate trays are for indoor use only. The black PVC absorbs sunlight and will warp if left out in the sun or exposed to high heat. Do not sun dry the tray after cleaning. Do not put any trays or PVC floor panels in the dishwasher as the heat will melt them. All items can be cleaned with luke warm water. 1) Credit Card. You do not have to have a Paypal account to purchase product. If you would like to pay via credit card then follow the Paypal payment button and it will provide you with the option to use a credit card without a Paypal account. 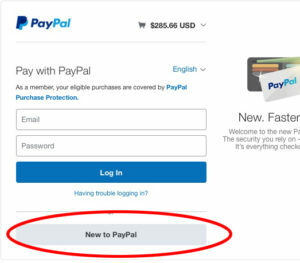 Follow the PayPal screens until you come to the part where you must enter in an account name (shown below). Select “New to PayPal” and you can checkout with just your credit card. You will NOT be required to sign up for a PayPal account. 1) Signature. On the checkout page (the next page) you’ll be asked whether you would like to sign for your package. This is to combat the growing trend of people following delivery trucks to steal packages left at the door. We prefer to send packages with signature required because that allows us to verify that you received the package. Alternatively, If you feel your doorstep is safe and are willing to accept the delivery notice from the shipper that the package was delivered as proof of delivery then we’d be happy to send the package without signature requirement. A requirement for signature is an inconvenience, but such is the world that it is necessary. We cannot change the signature requirement once the product ships, but if you find you are not able to be there you can call FedEX with the tracking number and ask them to hold it at a FedEX location for pick up. If we have to send you a follow-up package we will use the same setting chosen on your order unless specifically requested otherwise. Note: If you are not home or find a FedEX notice on your door, please respond promptly. They will send the box back to the shipper after three attempts. This return will be charged to you as will shipping it back the second time. 2) PO BOX Address. If you have a PO BOX address you must contact me for USPS shipping. The FedEX system will return a shipping cost to the shipping calculator, but FedEX will NOT deliver to a PO BOX. This is a bug in their system and they have not yet fixed it. If you do enter a PO Box and choose FedEX I will notify you that I need a physical address. If one is not available I will have to quote you USPS rates or I will refund your order. 3) Special Shipping Instructions. The delivery person will make their best judgement when leaving the package. There is no field to enter special delivery instructions on the shipping label so the delivery person is not guaranteed to read additional text. 4) Shipping Damage. There are occasions where the shipping provider damages the box and contents. In this case, send me pictures of both the damaged cage pieces and any damage on the box. In case of damage, inspect the entire contents of the box and let me know the entire scope of damage at one time. 5) Returns. Returns are accepted on unopened boxes. We will refund the product cost when we receive the product back in new condition. We cannot refund the shipping cost for any leg of the journey. 6) International Shipping. We do some international shipping. We charge the shipping cost to get there, but any fees, taxes, or duties to be collected on your end are not included and your responsibility. Unfortunately, I cannot provide information on what those costs will be. With an extensive product line such as we have we are in constant manufacturing of the different cages. Products in stock usually go out within 2 business days of your order. If we run out of inventory of a certain cage before the next build there may be a substantial wait (weeks to months) before we can ship. If your order is time sensitive please email to bill@dragonstrand.com to check on shipping time before ordering. If there is a wait then your placed order is a guaranteed inclusion in the next build. Build schedules are estimates. They are as accurate as possible at the time, but often shift. Once again, your ship date estimate may move around. 4/8/19 Note – We are currently in a backlog situation – Please review these estimates. If you don’t see your cage listed please inquire. The cages listed are build cycles that have cages available. Please consider signing up for the Newsletter in which I will deliver all the latest information to you twice a month. If you would like to hold off on purchasing until the cage you want is close to being built then check out this page to sign up for notifications in your email.